Toddlers, eh? They have a whole bunch of impressive and very, very cross choreographed moves in their meltdown arsenal. Here’s seven that are probably already striking fear into your heart. The windmill has a pretty high degree of difficulty and if it wasn’t so harrowing, you could almost be proud that your kiddo can master this complex move. Your toddler needs to stand rigid, scream and swing their arms wildly if you attempt to approach. Toddlers may launch objects from their hands as they windmill, so protective safety gear can sometimes be prudent. If you’re clever, you can use a windmilling child to freely sow seeds in your garden or feed chickens, so it’s not all bad news. Just squish the required things into their hands, stand back and watch them fling. Deliver some news that your toddler’s a little miffed by and The Jelly might rear its ugly, wobbly head. You can recognise The Jelly by its defeated, sloppy elegance and emo leanings. Your jelly-ing toddler will suddenly melt to the floor and may indeed be actually attempting to disappear. Sometimes, just for a split second, you wish they would, but you quickly scrape their ectoplasmic little bodies up, promise them a ride on the coin-operated fire engine and all is right with the world. Toddlers performing The Wave will lie horizontal on the floor and undulate their bodies alarmingly, moving back and forth in a motion that mimics the ocean’s tides. Attempt to move closer to your distressed toddler and they will lurch away from you, recoil and they crash towards you. The Wave brings with it random debris that mimics shoreline deposits. Where you might have seen cuttlefish, shells, driftwood and pretty pebbles, you’ll instead see the dead cockroaches, dust balls, used tissues and bits of chewing gum your child’s flailing limbs have swept from under the supermarket shelves. Bonus. The Log may seem like the best of a bad bunch, but in the hands of a particularly perturbed toddler, this move can overwhelm even the most patient of parents. The Log sees your toddler lying very, very still as they emit the kind of high-pitched and torturous wail that could be harnessed as a nuclear warning siren. Children’s infuriating wizardry renders their little bodies 112 times heavier than usual and sadly the only way to disarm The Log is with a Kinder Surprise and an iPad fully stocked with Peppa Pig. The Propeller is the whirling dervish of tantrums, part floor polisher, part shin bruising weapon of mass destruction. Toddlers exhibiting the propeller will lie on ground, flat on their back or belly, and spin all their limbs in various, often opposing, directions. To the untrained eye, it may look like they’re acting the lunatic, but in actual fact, they’re cleverly wearing down their attending parent’s defenses and ensuring that Mummy not only busts out her wildly entertaining hissing-evil-whisper-voice when they finally make it to the car, but that she’ll agree to pretty much anything for the sake of peace and quiet, post-meltdown and ever after. One minute everyone’s happy, gleefully looking at the Frozen stuff in Toys R Us. 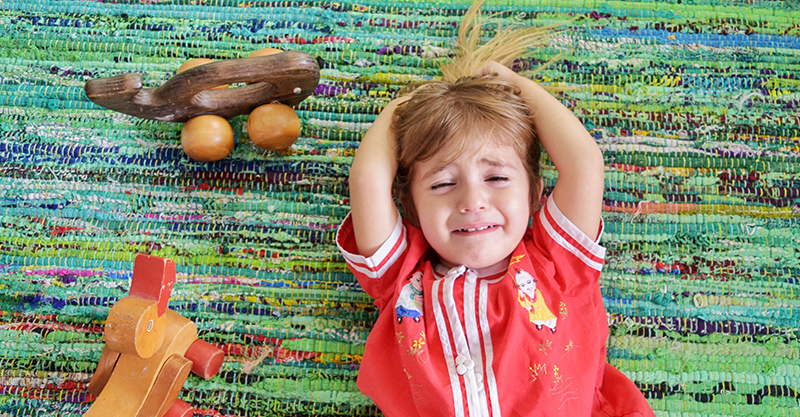 The next, it’s a total eclipse of the toddler heart as they place back of hand to forehead and collapse theatrically – and very, very loudly – to the floor. This move may be accompanied by honks of “But I wannnnnnnt it…!” or “Buy me onnnnnnnnne!” The Dying Swan is particularly defined by the tandem combo of raising head from collapsed position and wailing – then descending hopelessly to the floor again. Accomplished toddlers can repeat this sequence repeatedly and may throw in a spectacularly snotty nose and ears full of tears for dramatic effect. This much-feared meltdown sweeps up everything in its path and attempts to annihilate it. A tornado-ing toddler will spin, lurch, leap, stamp, twirl, swirl and hurl. Objects that have not been properly secured will be sucked mercilessly into The Tornado’s path, and indeed are often found many suburbs away. The Tornado is a mind, body and spirit freakout and will not only make every parent’s blood run cold, it will have bystanders double-checking their birth control’s effectiveness as they breathe forcefully into a paper bag. Guys! Which tantrum is your favourite? !